It’s time to get Loony! Skip on over to Loony Bingo for the quirkiest bingo experience! This well-designed site has a wacky theme with the cutest bingo ball cartoons jumping around! You’ll go crazy for the amazing bingo and slot games plus the best promotions ever! 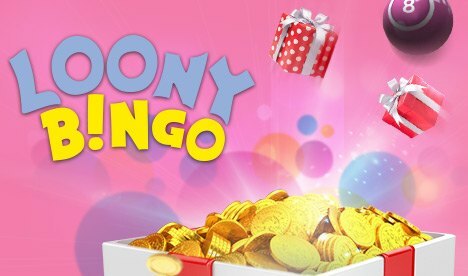 Join Loony Bingo for bonuses that will make you go bonkers! All you have to do is sign up and add £5 to play with £80! This generous offer rewards you £75 worth of FREE tickets + 5 Spins on Kingdom Of Cash! Have the craziest time online while enjoying free games, incredible rewards, daily specials, and more! Plus, all players can access free bingo at Loony Bingo! Head to the Free Bingo rooms so you can play for free and win for real! If you really want to reap the biggest bonuses become a VIP member! Join the elite VIP Diamond Club and claim the most exhilarating rewards including real cash bonuses, special gifts, extra freebies, exclusive promos, and more! Play hundreds of the best online bingo and casino games at Loony Bingo! Enjoy loads of games like 75-ball, 90-ball, and 5-line bingo with jackpots bursting at the seams! Play the daily and monthly Jackpot games for the biggest wins! Loony Bingo also has a massive selection of online slots, casino games, scratch cards, and instant win games for loads of casino fun! Play your favourite gaming titles while winning big! Spin to Win the lucrative progressive slots jackpots for prizes reaching into the millions! Good luck! And remember, you can have all this fun on the go when you play from your smartphone and tablet! Just head to Loony Bingo on your mobile and win big from any location!